This was a dining highlight. After wandering the few main streets of Blenheim, looking at two or three recommended places that had dispiritingly similar menus (in price - $NZ20-30 mains - and content), we made one last turn down Scott Street and espied Poppy Thai from afar. After plenty of mod-Australasian and Mediterranean dishes thus far on the trip some Asian sounded just the go. The décor was entirely suitable – fake flowers, over-the-top tablecloths and placemats, elephants everywhere. One touch I did like were the info sheets on each table about the medicinal benefits of the most common Thai herbs, produced by the Thailand Tourism Board. Our waiter was about 14, and didn’t talk much, but did all the right things. 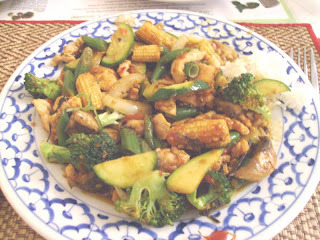 My meal was the Pad Bai Krapraow: stir fired basil, babycorn, peppers, chillies and veg with chicken ($NZ15 and note, we found in NZ Asian restaurants often included rice in the price of the meal). The dish was fantastic – all the ingredients were fresh as, and the sauce too held the just-picked basil taste, the mintiness of which balanced wonderfully against the chilli heat. SG went with his standard of stir-fry with oyster sauce ($NZ14.50 with pork, inc rice), which delivered a similar taste hit.